Literally. Express yourself. We're only here to help you. We're waiting on a script that allows users to download files from our FTP. It should be done this week. ok thanks a lot and by the way how to get those pie things and stars? Last edited by killer-bee on Mon Aug 28, 2006 9:37 am, edited 1 time in total. The stars are gained either via post count or staff status on the website. You get pie when someone chooses to give you pie. Gemini wrote: The stars are gained either via post count or staff status on the website. You get pie when someone chooses to give you pie. Is there a limit to the amount of pie one can give? Only the Pie itself can determine that. Do not abuse the Pie- It does have the ability to even eat you. You can give Pie to one person every so often, so choose the recipient wisely. It is advised that you give only to those worthy of Pie, as a way of congratulating someone for a job well-done. I really love what you guys did with the place. Looks like I left the site in capable hands. You need better smilies though. also, I want to steal this theme from you guys for my own personal use. Warbringer87 wrote: also, I want to steal this theme from you guys for my own personal use. Aye, generic theme ahoy. As I said before, a more non-generic look would really say to people 'you are looking at a great unique site and not just a clone or wannabe'. Can you help me in the StarEdit too? I was creating a map with computer enemies in it,and i gave them AI.I started to play and i realized that the computers do not make SCV's from their standard Command Center,they built another Command Center near to the minerals and started building SCV's in that new Command Center.How can i fix it? 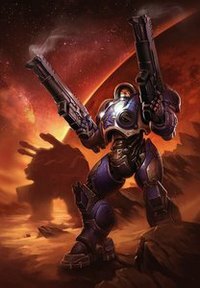 What AI did you use because I use like Terran Campaign Difficult etc (and the other ones) and they build SCV's at the CC I build.